OK, stay with me here. 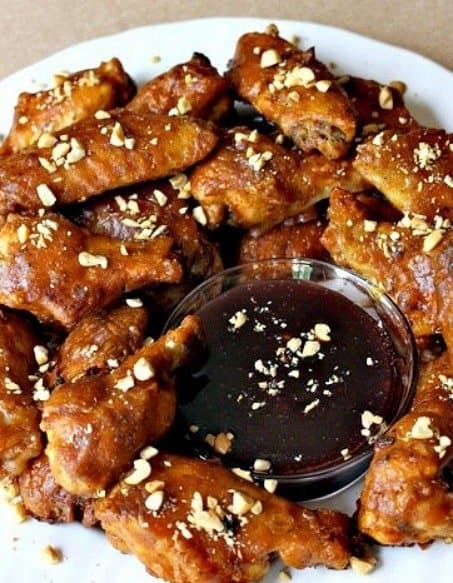 Because these Peanut Butter and Jelly Wings might become your new favorite wing. 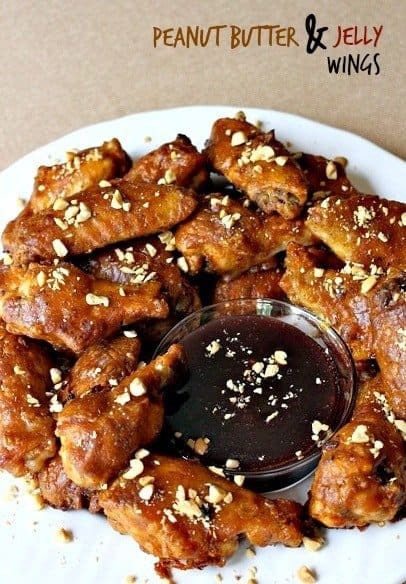 Crispy wings with a peanut flavor dipped in a savory grape jelly sauce! 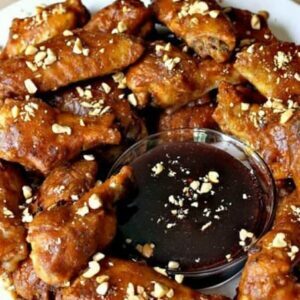 The wings are baked until super crispy, then coated with a peanut sauce and served with a raspberry jelly dipping sauce. Did I loose you yet? The best way to describe these wings is to compare them to a peanut satay sauce. I used Smuckers® Natural peanut butter so it doesn’t get too sweet. These wings have a lot of asian flavors going on…the raspberry sauce is flavored with hoisin and soy sauce and the peanut sauce has sriracha and coconut milk. It’s a sweet and spicy combination that goes perfectly together. You can easily make these wings spicier, or keep them more mild. I like them with a little heat but they’re not overly spicy at all. Not like the kind of wings that you need one hand on your beer at all times…just the perfect amount of background heat. Start by preheating your oven to 425 degrees. Season the wings with salt, pepper, garlic powder, seasoned salt and chili powder. 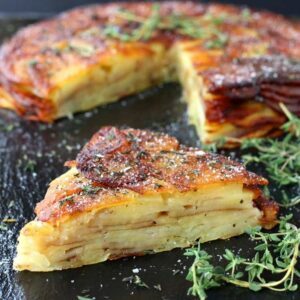 Pour some olive oil over the top and cook them for 45 minutes. While the wings are in the oven you can start making both sauces. For the peanut sauce, get a medium sauce pan and start cooking some chopped garlic in olive oil on low heat. 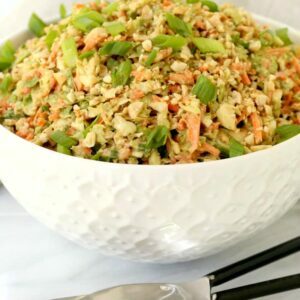 Add in the rest of the ingredients for the peanut sauce, stir well and set aside. To make the raspberry dipping sauce, all you need to do is add the jelly, I used Smuckers® Raspberry jam, hoisin and the soy sauce to a small pan over low heat. Whisk the sauce until the jelly is smooth then add a tablespoon of Wondra flour to thicken it up. 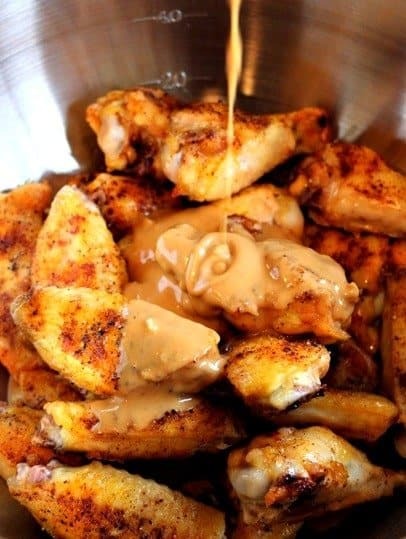 After the wings have roasted, take them out of the oven and toss them in a large bowl with half of the peanut sauce. When they’re tossed up and all coated, place them on parchment lined baking sheets and baste with additional peanut sauce. You want to make sure they are really coated with a lot of the peanut sauce. Place back in the oven for 10-15 minutes. Garnish the wings with chopped peanuts and serve with the raspberry dipping sauce on the side. Tell your guests that you’ll be serving Peanut Butter and Jelly Wings for dinner…they’ll think you’re crazy until they try them! And bonus – the kids love these wings too! Anything peanut butter and jelly for the kids right? Start by preheating your oven to 425 degrees. Season the wings with the salt and pepper, garlic powder, chili powder and seasoned salt. 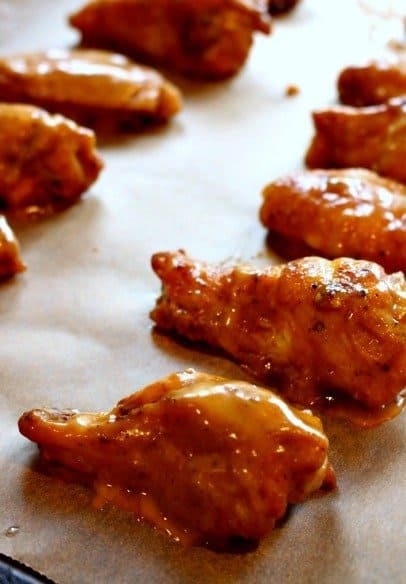 Drizzle olive oil over the wings and place them in the oven for 45 minutes until crispy. While the wings are cooking you can start your sauces. For the peanut sauce, add the minced garlic into the olive oil in a medium saucepan. Cook for 2-3 minutes over low heat. Then add in the rest of the peanut sauce ingredients and stir well. Set aside. In a small sauce pan, add in the ingredients for the raspberry sauce (except the Wondra flour) and stir well over low heat until the jelly dissolves. Once the jelly is dissolved and slightly bubbling, stir in the Wondra and stir until the sauce thickens. Set aside until your wings are ready. After the wings have roasted, take them out of the oven and toss them in a large bowl with about half of the peanut sauce. When they’re good and coated, place them on parchment lined baking sheets and baste with additional peanut sauce. Garnish the wings with chopped peanuts and serve with the raspberry dipping sauce on the side. omg, thank you very much for posting this! It is gonna be so helpful when I get Coconut Milk at the store! Very Cool! Thank you! Very different, but addictive once you start eating them. I hope you try it! Can I use all purpose flour? Hi Marsha! 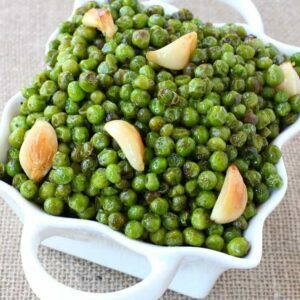 Wondra is a thickening flour that doesn’t require you making a mixture of flour and water or cornstarch and water…it’s a wonderful product if you even come across it in your grocery store! But yes, you can use cornstarch or flour to thicken the sauce instead but just mix it with water first before adding it to the jelly. I used pork chops instead of wings and I skipped on the jelly sauce. This was just what I was looking for!